Private and personalised Madrid experience with a specially handpicked Host. What better way to get an authentic taste of Madrid than to eat your way around the city with a fellow foodie? With your carefully matched Host by your side who is as passionate as you are about eating authentic local dishes and buying seasonal produce and regional speciality ingredients, discover where the local foodies head for their fix of Spanish classics and to shop for their favourite foods. 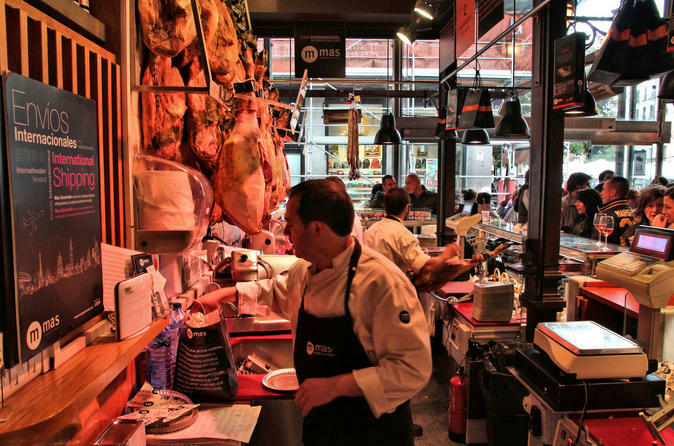 Discover Madrid’s best kept foodie secrets: from hidden tapas bars to artisan delis, the best food markets to local cafeterias, we promise it will be delicious! Join your personally hand-picked Host who is a foodie like yourself and eat and shop your way around the most delicious markets, neighbourhood tapas bars and food halls in Madrid! Get to know Madrid’s food: from traditional staples to innovative twists on the classics, exquisite tapas to churros on the street corner, your Host will take you to three of locals' favourite markets, neighbourhood tapas bars and cafeterías where you can taste the best local dishes and artisanal produce. Spend time getting to know your Host who's been thoughtfully matched to you; chat about your favourite cuisine and get some insider recommendations and tips for the most authentic locals places to eat and drink on the rest of your trip so you can avoid the tourist traps and get the most out of your visit. * Join your hand-picked Host and discover Madrid’s incredible food culture and taste classic Spanish dishes.